Under section 87 (2) of the Local Government Act 1972, notice is hereby given, that two casual vacancies will exists for Parish Councillors in the Parish of Collingtree arising from impending Resignations of two Councillors. One vacancy will exist from 28th March 2019 and one from the 8th May 2019. To read notice, please click on the link. When running at full capacity the full Council consists of seven members, all members live within the Parish. 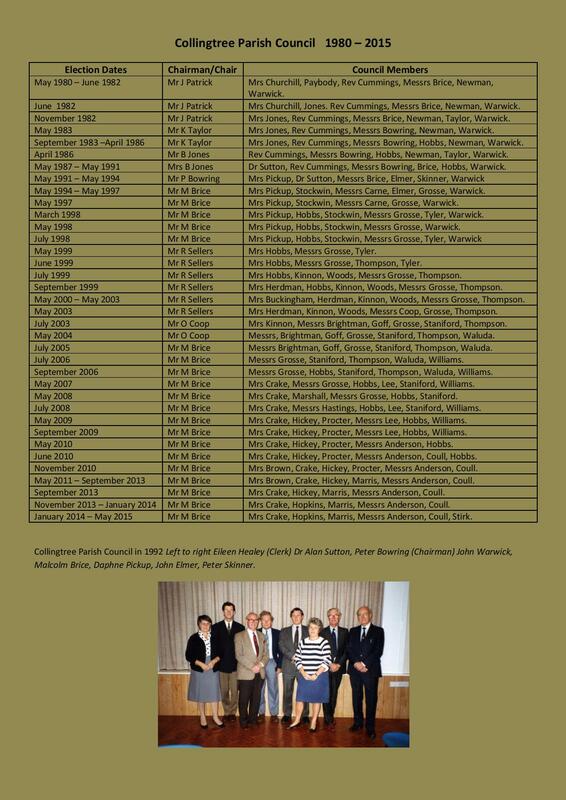 Three Councillors representing Collingtree North (Collingtree Park) and four Councillors representing Collingtree South (the original village). March 2019 - Following the resignation of the Karen Hopkins a casual vacancy now exists for a Parish Councillor in the Parish of Collingtree. If you feel you have a few hours a month to spare and would like to get involved in the decision making of the Parish, Please consider applying for the vacancy. The Parish Council welcomes a new member Ian Hill to the council. Ian Hill is the latest member to join the PC and was co-opted as Parish Councillor at our 14th March 2018 meeting. Following the resignation of the the Vice Chairman Colin Stevenson a casual vacancy now exists for a Parish Councillor in the Parish of Collingtree. Colin was a great asset to the Parish Council and will be greatly missed. It was with great sadness the Parish Council announced the passing of Councillor Trini Crake. Trini was a valued member of the Parish Council and was very passionate about helping members of the community. Trini will be greatly missed! Councillor Malcolm Brice was a long serving Parish Councillor and has served on the Council on and off for the past 22 years, stepping down as Chairman in May 2016. He was first elected as Chairman in 1994 taking a five year break between 1999 and 2005. Malcolm rejoined the Council and was elected Chairman once again. In total Malcolm has served a total of 16 years as Chairman and 6 years as a Councillor. Malcolm gave notice to the Council in 2015 that he wished to step down and left the Council on 31st October 2016. The Parish Council appreciate all the hard work, dedication and hands on approach Malcolm has contributed in the last 22 years. Mrs Shirley Wong - The Parish Clerk and Responsible Financial Officer is the only Council employee and has been in post since April 2015. The Clerk is normally the first point of contact with the Parish Council from the electors point of view. Shirley has eleven years experience working as a Parish Clerk / Responsible Financial Officer. Shirley is a fully qualified Clerk after completing the lengthy CiLCA Course (Certificate in Local Council Administration) which is a National Qualification for Parish Clerks in June 2017.